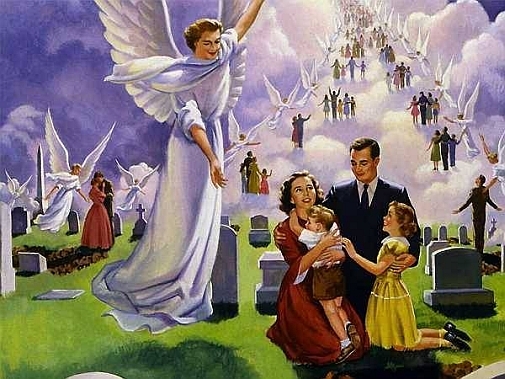 Opinion Forum » Are You Ready for the Rapture? A small minority of Christians actually believes Jesus is coming back on May 21, 2011 — Saturday! They base this on the rambling Revelation of a kook old man writing in isolation on a Greek island a couple of thousand years ago, plus some other stuff in the Bible. It hasn’t been determined, so far, which halucinogens John of Patmos, the supposed author, may have favored. The May 21 date was figured out by another kook old man, Harold Camping. He guarantees it will happen around 6:00 pm EDST, perhaps indicating an answer to the age-old question: Does God operate on daylight savings time? All this shows that Christians (or at least some of them) can be just as goofy as Muslims or adherents to other systems of belief in the irrational and supernatural. The big difference, of course, is that Christians aren’t nearly as violent as Muslims (never mind the occasional abortion-inspired murder or fire-bombing). I already said what I have to say about this silliness a while back, so here it is again: Apocalypse Now — or Not? According to news reports and lots of blogospheric blather, the apocalypse is predicted to begin on May 21, 2011. This comes from Harold Camping, 89, who is the leader of Family Radio Worldwide, an independent Christian ministry. Camping last predicted that the end of the world would come in September 1994. Despite his less than stellar record for predictions, there are apparently a lot of people willing to stick with him — who knows, maybe he’ll be right someday. It goes without saying that Camping is a strange old guy, but there must be something that motivates people to take him seriously. Maybe it’s the deep voice, the molasses-slow cadence of his delivery, or his cadaverous appearance. Who knows; make your own judgment from the audio and video available at Family Radio Worldwide. Just don’t blame me if you come back bug-eyed and drooling, ready to meet your maker in a few [days]. On top of that, the state of Israel was established in 1948, we have global warming, the earth and space are massively militarized, terrorism reigns, the world is overpopulated, a young farmer just spotted four weird-looking guys on horses on a wooded hill in upstate New York, and thousands of birds have been falling from the sky in Arkansas, to mention just a few portentous events. I mean, how much more do you want? As I understand it, Camping’s prediction is that the rapture will be on May 21, and the final day will be in October. On May 21, all the people (dead and living) in good standing with The Man will join Him up in the air somewhere (presumably creating one hell of an air traffic control problem). Everyone else will have to wait until October, when they will get their assigned places in an environment of hellfire and brimstone. I find this rapture part pretty interesting. As I understand it, the good guys will just suddenly disappear. Everybody else will stand around in shock. I can see a business meeting in progress when it happens. Suddenly there’s dead silence, everyone staring at piles of clothing in two of the chairs at the table. “Where’s Frank?” one of them asks. “Elvira’s gone,” another guy observes, wondering what she looks like without all those clothes. And what if you’re flying on an airliner, and both the pilots are among the chosen? Two piles of empty uniforms and underwear in the pilots’ seats? Then a frantic announcement asking if there are any pilots on board? (In my experience with pilots, I’m sure most of us would still be around.) If I were on the plane, I’d go forward and take a crack at landing the thing, but not before somebody else moved that underwear off the seat. It’s easy enough to make fun of something as comical as this, but what’s actually happened in the past ought to give us pause. These kinds of extremist religious beliefs often spin off weird cults, and they have sometimes resulted in lost futures, severe abuse, suicides, and murders. So we should all keep an eye on each other as May 21 approaches. If some of our friends suddenly disappear in a puff of smoke or whatever, leaving empty suits behind, then we know that the rest of us are in trouble. Real trouble. But if they start buying tickets for Jonestown or Waco, lock them in their rooms. Finally, don’t forget — the Antichrist is supposed to be out and about, acting as Satan’s agent as the big day approaches. Know anyone who’s trying to create a world government through promises of peace and wants to gain control of the world economy? Just asking…. President Obama is sometimes* referred to as an “empty suit.” Does this mean that he is among the anointed? If so, who is pulling the strings in his administration? We need reliable, serious answers to these important questions. * Google Obama, “empty suit” and there will be 833,000 results. Hmmm. You pose a vexing metaphysical question wrapped in a paradox. 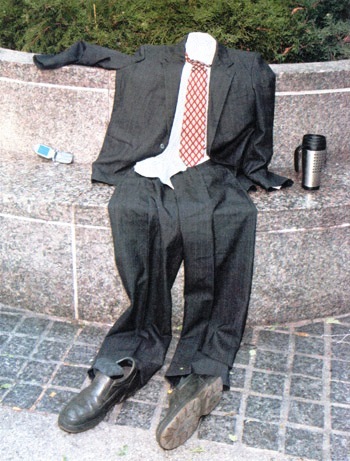 If Obama’s suit is already empty, that might mean that he got raptured ahead of everyone else. Could that be because Rev. Wright was right after all, or could it be that Obama got moved to the front of the line for no discernible reason related to merit, which may simply have been a response to established precedent? On the other hand, if the rapture is nothing more than run-of-the-mill religious mindfoolery, Obama’s empty suit may lend credibility to the fears of extremist right-wingers (many of whom are expecting to be raptured Saturday afternoon) that Obama’s candidacy sprang from some dark corner of Manchuria. On the third hand, the suit may not really be empty because Obama has become so emaciated from eating Michelle’s mandatory cockamamie diets (while she contentedly munches tamales) that his body has shrunk to the scale of a Sudanese refugee. These really are serious questions, and a concerned public wants to know…. Well, where I am it’s now 7 pm on May 21. I waited the extra hour just in case God isn’t working on daylight savings time. Everything looks fine, and no one I know has disappeared (of course, that might not be much of an indicator). It’ll be interesting to see how the religious fruitcakes rationalize this latest bogus prediction. In any case, I’m sure they’ll keep sending in gobs of money to charlatans like Camping. Well here it is Sunday 05/22/11 and all I know re:05/20/11 Judgement is I’m typing my comment here. There’s been Doomsday predictions going back to 1000 AD when many Believers sincerely believed the 2nd coming of Christ would occur one millennium from his ressurection. Quite a few of the adventist sects were started by end of the world predictions. In the NT it states the exact time and place is unknown. Ergo it is impossible for anybody to predict including Harold Camping. For our purposes at this point in time, 2011 is accurate enough, but to pinpoint an exact match to the Passion and Resurrection…hardly. The issue is, primarily, that nobody started counting years immediately after the resurrection. By the time they got to thinking about formalizing such things, a number of years had elapsed, and the assignment of a “Year 0” was a best guess. Hey,Tom,maybe it happened,but none of us were in good standing with the Man. Hmm,possible? We are all sinful, and so only a tiny handful went up. L.O.L. Stupidity runs rampant,sometimes,even in all religions.